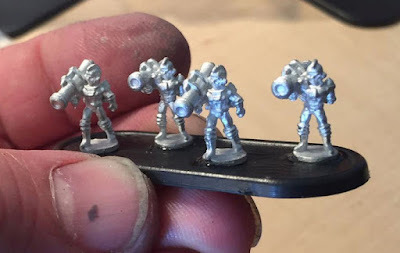 Hydra Miniatures: New 10mm Galacteer tanks for Atomic Tank, our upcoming ground assault game in the Hydra Miniatures "Retroverse." Atomic Tank--Planetary Invasions in the Atomic Age. This is our third in a series of games taking place in Hydra's Retroverse, a gaming universe based on the Golden Age of Sci-fi (1930s, 40s, and 50s). All of our games share the same races and background. Our first game War Rocket--Space Battles in the Atomic Age featured 6mm rockets and introduced players to the forces of the Retroverse. Retro Raygun--Action Adventure in the Atomic Age expanded the Retroverse with a 30mm battle game that introduced us to the heroes and the villains of the Retroverse. 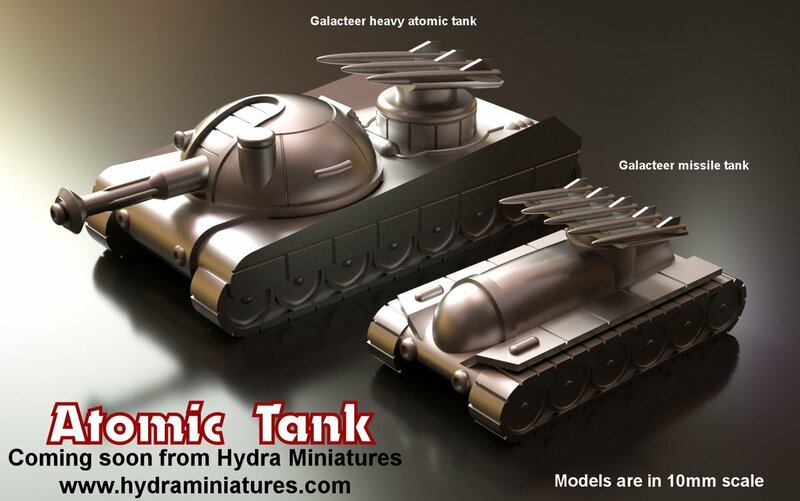 Atomic Tank features the same forces in massive battles raging for control over planetary landscapes. At Hydra, we like our games to be fast-paced and simplified so the game only uses a couple of charts, minimal stats, and no record keeping. The Atomic Tank game engine is based on the War Rocket rules and players can use their rockets for air support in the game. Initially we conceived the game as 6mm, but switched to 10mm to showcase the highly detailed digital sculpts. 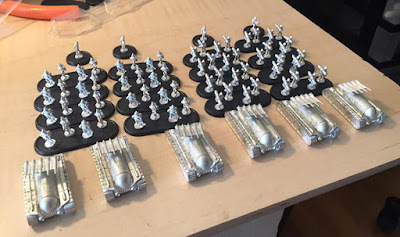 The game will feature five forces: Galacteers (human space patrol), Robot Legion, Valkeeri (space amazons), Imperials (despotic space tyrants) and Zenithians (Saucermen from the 7th Dimension).